By switching to LED lighting our clients have saved on average 60% off their energy bills. By choosing LED lighting for your industrial unit, you could expect to see your business’ lighting bills cut by as much as 85%. That, combined with the fact that customers save an average of 60% on their energy bills by using our impartial comparison, means that your business could soon experience a dramatic cut in the price you pay for utilities! Often, industrial units require a constant and reliable stream of high quality, bright lighting. Unlike traditional incandescent or halogen light bulbs, LEDs offer some of the brightest glows; making them ideal for larger units. In industrial units that require constant lighting all-year round, you may grow to be concerned about the amount of ultraviolet (UV) or infrared (IR) radiation that is being emitted from traditional light bulbs. However, LED lighting doesn’t emit any of these types of radiation. As a business owner, you’ll probably relate to the frustration that comes with constantly updating and changing items of your industrial unit that are no longer up to scratch, or have a short lifespan. LED lights last around 25-30 years before they need replacing, meaning that there’s not an on-going requirement to constantly change the light bulbs on your premises. How can industrial units use LED lights? Now that we’ve highlighted the benefits of LED lighting for industrial units, you may be wondering exactly how your business can use them to reap the best rewards. 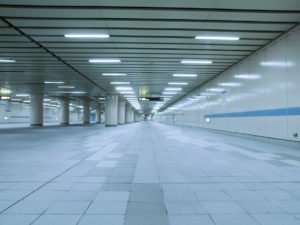 Industrial units with a large amount of internal space can use LED lights as their first source of lighting, implementing them within the existing lights of the property. You can also install LED lighting in any external areas of the property, such as outside sheds and working spaces. Because LED lights work well in colder temperatures unlike CFLs, using this type of bulb within this area is bound to be beneficial. Now that you’ve discovered the benefits of installing LED lighting in your commercial unit, feel free to use our comparison tool to reduce your business’ utility costs even further!